Very few children’s stories are for children. To put it more accurately, there are no fairy tales which we would deem suitable for children today if we were to tell them in their original form. Even some expurgated versions are pretty raw — Hansel and Gretel is essentially a story about child abandonment and cannibalism with raging overtones of ageism and sexism. My point here is — up until the 19th century, there was no real distinction between literature for adults and children. The stories which we now consider fairy tales were drawn from fireside folkloric traditions and contained overt elements of sexuality and violence. Victorian attitudes cleaned these stories up and wove in a strain of sanctimonious moralising, but what they could not fundamentally alter was their vast array of powerful archetypes. Wicked Stepmother, Royal Castle, Prince Charming, Enchanted Forest, Fairy Godmother, Hidden Cottage, Lost Princess. The strength of these archetypes lies in how well we know them. The princess must always leave the castle, fleeing her stepmother. * She will always escape to the forest and help will always be found in a humble cottage. Her fairy godmother leads her to her white-horsed royal rescuer. Every single enchanted forest of our imagination coalesces into a magical, almost mystical stage of compound remembered tales. Snow White is picking her way through the trees, moving inexorably towards the cottage of dwarfs. Belle is looking through the branches at the distant (yet still too near for her nervous heart) castle of the Beast. Little Red Riding Hood is about to step off the forest path to pick flowers for her sickly grandmother, treading over the trail of breadcrumbs that Gretel scattered a few hours before. A princess wrapped in the skin of a donkey takes shelter under the trees, resting her feet whilst she flees an unwelcome marriage. 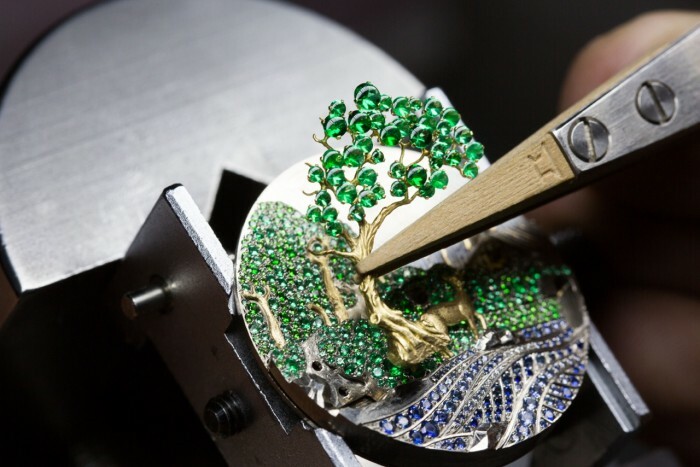 You don’t have to know the story of Peau d’Âne, a Charles Perrault tale, in order to appreciate the Van Cleef & Arpels Lady Arpels Peau d’Âne Forêt Enchantée. The provenance of the story resonates with the heritage of the French brand, but as I observed above, enchanted forests live in all our imaginations. 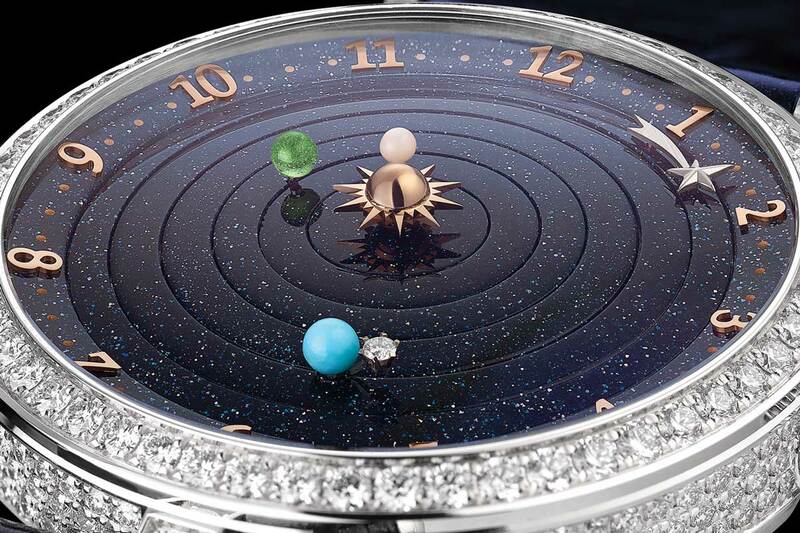 In conversation with Nicolas Bos, CEO of Van Cleef & Arpels, a few years ago, we talked about the universality of symbols in the Van Cleef & Arpels collections, and how they played across different cultures. In every storytelling tradition there are established such cues and locations that transcend cultural and geographical limits. 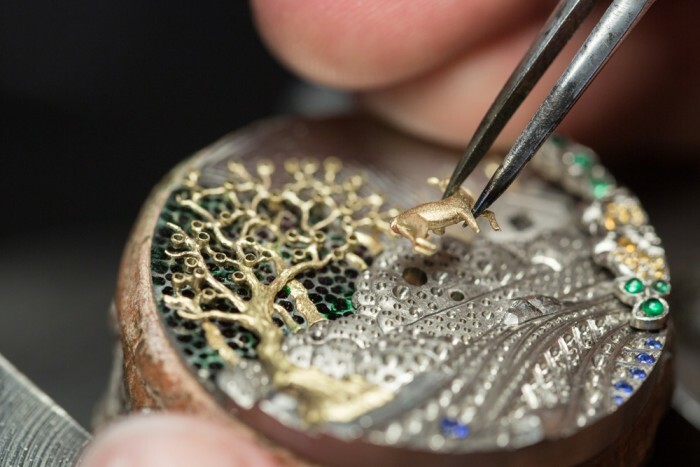 The heavily worked dial of the Peau d’Âne Forêt Enchantée is remarkable because of its sheer artistry, of course — engraved gold doe, engraved gold tree set with cabochon-cut emeralds, a stream set with multi-hued lines of diamonds and sapphires, craggy white-gold rocks, garnet-breasted robins, a cottage spilling forth a topaz glow from its window, a miniature-painted night sky with a plume of chimney smoke (inexplicably, magically, mysteriously) winding its way behind the plump crescent moon. What the Peau d’Âne Forêt Enchantée really touches in all our minds, however, is this very brocade of associations and emotions that create the archetypal forest in our collective consciousness, and the very richness that comes with an idea at a cultural crossroads. We all know the apprehension of fleeing a place we thought was a safe castle but turned out to harbour an oppressive menace. We know the heart-racing plunge into an intimidating wild place and the eyes of its (hopefully) benign inhabitants; we know the spring of hope and assurance of safety that comes with a light in the window in the distance. In Michael Ondaatje’s novel, The English Patient, the eponymous character falls in love whilst listening to a woman recount the tale of Candaules and Gyges from Herodotus’ Histories. “Words, Caravaggio,” he later remarks to a companion. “They have a power.” So do the ideas contained in those words. So does the art that these ideas inspire. 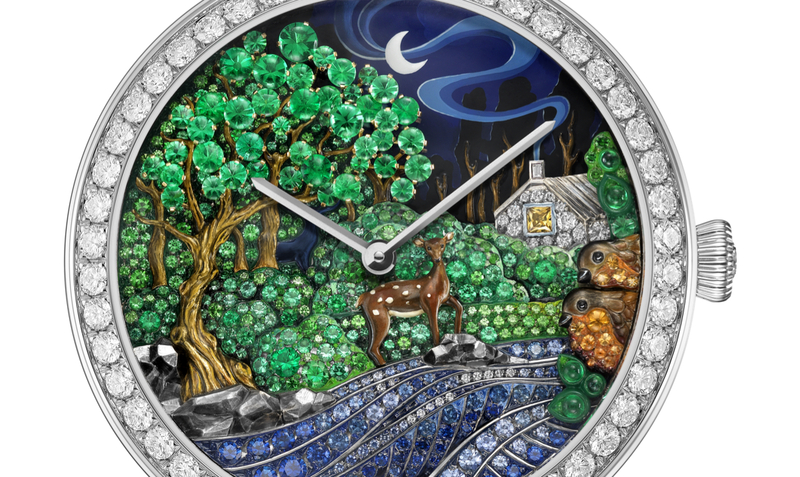 The Van Cleef & Arpels Lady Arpels Peau d’Âne Forêt Enchantée takes us back to that moment balanced on the cusp of danger and salvation, and immortalises it in glittering eternity. Just like a story. * In the Peau d’Âne story, the stepmother that the princess is fleeing is actually herself — her father the king is determined to marry only someone who can match the deceased queen in beauty (guess who that turns out to be). Told you this wasn’t a story for kids.